Shana Beernaert of the International Class corps Beatrix, submitted this photo and caption. 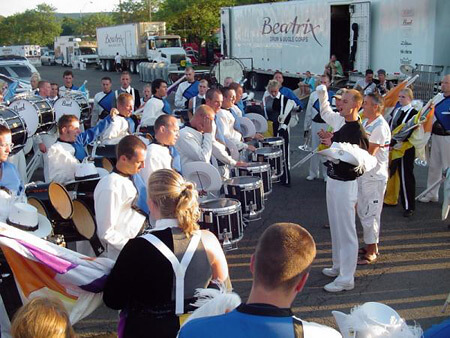 The 2008 Drum Corps International season is a great memory for all of the members of Beatrix Drum and Bugle Corps from Hilversum, the Netherlands. This photo was taken after Beatrix's very first performance this past summer on our tour of America. Only able to rehearse for a few hours a couple times a week leading up to our trip, we had to work very hard, but we had the experience of a lifetime! Though we had our hard moments, every corps and staff member kept encouraging each other throughout the entire trip. Thank you!